“The franchise rights alone will make us rich beyond our wildest dreams,” Bill Murray once declared in Ghostbusters, and increasingly Sony seems to be making good on his promise (even if Murray himself doesn’t want any part of it). Deadline reports that the studio is now developing a “male-driven” counterpart to Paul Feig’s upcoming Ghostbusters reboot, one that will put the business of ghostbusting back in the phallic wand-grasping hands of men, as it was for our ancient forefathers of the 1980s. Standing up for a man’s right to feel good about bustin’ is reportedly the first priority of the newly formed Ghost Corps, which will return Dan Aykroyd and Ivan Reitman to the Sony lot to dream up more of the “branding opportunities” that Ghostbusters fans have been denied for an intermittent day or two since 1984. First up: It’s a man’s life in the Ghost Corps, with Captain America: The Winter Soldier brother duo Joe and Anthony Russo looking to direct a new, all-male Ghostbusters movie written by Iron Man 3 screenwriter Drew Pearce, and potentially starring noted man Channing Tatum. Tatum has long made it known that he’d like to star in a new Ghostbusters movie, with emails from the Sony hack that, increasingly it seems, we may as well just talk about revealing that he and Chris Pratt were meeting with the Russos about creating a new, Batman Begins-style reinvention of the Ghostbusters “mythology.” As Reitman explains to Deadline, that plan fits in with the expansion of Ghostbusters into a shared universe that he and Aykroyd have been discussing for decades—and more recently this past fall, when Aykroyd threw the word “Marvel” into the mix for good measure. Reitman says he hopes that the Russos will be able to shoot this new, all-male-revue Ghostbusters by next summer, followed by a release in 2017—and then “a lot of wonderful movies” after that, possibly one for each gender identity or even species on the Ghostbuster spectrum, eventually leading to the inevitable, all-ghost Ghostbusters. 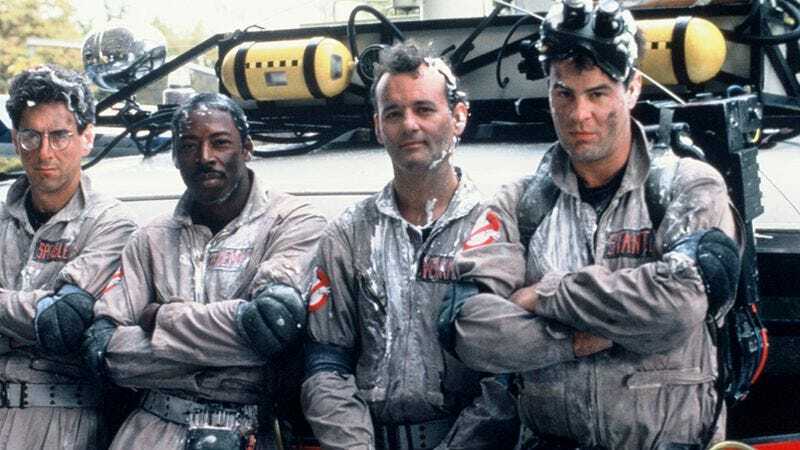 As of now, it’s unclear whether this all-guys’ Ghostbusters will also ignore the original Ghostbusters, like the all-female Ghsotbusters will, or if it will find a way to fulfill Aykroyd’s continued insistence that he will return with Ernie Hudson in an all old-guys’ Ghostbusters. But for those Internet activists who spent the past year lamenting that Ghostbusters is being unfairly taken over by women, today Sony has reassured them that guys can be Ghostbusters, too.